Each time I mention an estate sale I get more than a few questions about them so I figured it would be a good idea to make a post about them and hopefully inspire a few people to go to one! What’s an estate sale? 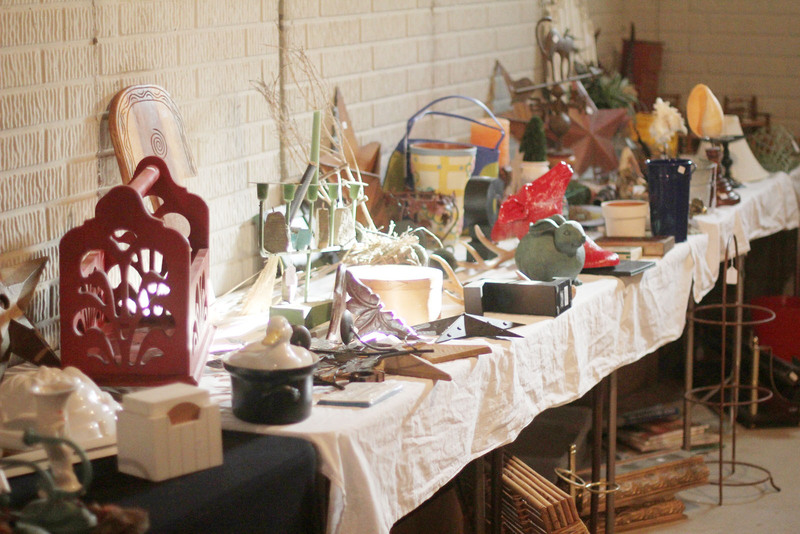 An estate sale is like a really big garage sale, basically. Estate sales usually occur when someone dies or moves to somewhere where they will be unable to keep their things (like a nursing home) and their closest of kin are unable or unwilling to keep their possessions and need to sell them quickly. What can I expect from an estate sale? In most cases estate sales are located in the former owners home and you’ll be able to enter the house and shop, just like it was a store. Some sales are conducted by companies and some are organized by the family. Either way, if it’s an estate sale and not an auction all of the items will be priced. Sometimes it might be categorized (ex. there might be signs around the house : clothes $2/piece, purses $.50, shoes $2/pr) and other times each item might be individually priced. There is a common misconception that estate sales are only for the wealthy, this is most definitely not the case. You can find lots of steals (like 50 cent vintage dresses or a $20 couch) at these sales. You shouldn’t judge a book by it’s cover but try to keep in mind if you’re in a wealthier neighborhood chances are you’re going to be paying more and finding bigger ticket items. We live in a smaller town and tend to find estate sales where the homes full of small items at great prices. Don’t be afraid to stop in to a sale even if you think the outside of the home looks a little too rich for your tastes – you never know what’s inside! • estatesales.net. This website is a very valuable resource of mine. On the front page there is a map where you choose your state and then the city closest to you. From there it will show you all the estate sales going on in the upcoming weekend. It’s best to check often because a lot of the time there isn’t much warning. Their mailing list is a life saver! You give them your email address and zip code and they’ll shoot you an email when a sale is coming up in your area. • iPhone apps! My two favorite apps for finding estate sales are Garage Sale Rover (free!) and iGarageSale ($1.99). Garage Sale Rover is particularly useful as it indicates estate sales with blue markers as opposed to the red ones garage sales are marked with. • Craigslist! Try searching “estate sale” in the for sale section of the search. • Unless you’re going to buy something that you saw listed in the ad, try going on the last day of the sale. At estate sales the point is to get rid of all these things so on the last day there will usually be a big sale. 50% off is common but I’ve seen up to 90% off!! • Be courteous. When the sale is put on by the family members a lot of the time they’ll be the one who is at the check out or watching over the rooms to make sure people aren’t stealing, remember that they most likely just lost someone. There have even been instances where we’ve walked into rooms where things were for sale and found someone grieving. It’s best to smile politely and walk out of the room in that case. • Take your time exploring the house. Go in every room that you’re allowed to (if you’re not allowed to enter a room it will be marked “private” and be closed off), check closets and make sure not to forget the basement and sometimes even the attic. Even if you don’t find anything to buy it really is an amazing opportunity to visit a home. There was one beautiful mid century time capsule of a home we went to an estate sale at that I literally teared up because it was so gorgeous (seriously, it was my dream home!) It’s an amazing experience to be honest. • Always bring cash! I’ve never been to an estate sale where they accept credit cards but some do take checks. • Unless it says “not for sale” don’t be afraid to ask about purchasing something! Love the curtains? the stove? that rug? Ask how much they’d be willing to sell it for! I hope this helps! If anyone else has any more questions about estate sales feel free to ask! Thanks for the info and tips, super useful! I've always wanted to go to an estate sale and go thrifting but we don't have any of that here…hopefully will be able to go to the US on vacations and thrift! Great post! I've always been a little nervous to ever go to an estate sale. I know that sounds silly, but it's someone's HOME, you know? I think the next time one rolls around, I'll go! I love estate sales. I've never seen any in Scotland, but when I lived in the states I went to them all the time. Living in the midwest also offers the ever-present and somewhat hokey but usually amazing BARN SALE. Great post, Kaylah! Although I hope it doesn't bring too many more people to estate sales in my area. Ha. Interesting post! I have often wondered about this type of sale and have never been to one. Now that I am informed, I won't be shy about going next time I see an Estate Sale being advertised. I am so glad you wrote about this! I love reading about all your awesome finds and I've been dying to go to an Estate sale, but didn't know anything about them. 🙂 Have a great day today! I looove estate sales. I go so often I know which companies are the more expensive ones and usually wait until the last day and which ones start out cheap enough that I can go the first day and get the good stuff. haha. this is a great 101! i LOVE going to estate sales. i have found some pretty amazing (& cheap!) things at them before. i love the fact that at estate sales, since they sell everything that a person has accumulated over the years, a lot of the items are vintage! Wow! Thank you Kaelah for all of these great tips. You are a lifesaver haha. 🙂 I've never (!) actually been to an estate sale,so I'm really antsy to go to one after reading this post! estatesales.net is amazing! I had literally just been thinking that I needed to find a new estate sale resource! Definitely passing it on. Thank you!! Thanks for these tips. Though I'm always at garage sales, thrift shops, and rummage sale, estate sales remain as my last untaken adventures in thrifting. I've always been sort of afraid to go, but I think I'll seek one out with these tips in mind. estatesales.net is my favorite site! I have a hard time finding estate sales in Georgia and they were all over in Michigan. I'll be downloading those apps. Thanks for the tips. Kaylah, great post! I linked to it on the EstateSales.NET FB page. Hope it helps! I love estate sales so much 🙂 On the last day of the estate sale- its usually half of the price. Have you read the book American Pickers? They have some really great tips on how to literally dig at estates. I love this! I live in LA so the idea of going to some awesome houses sounds SO fun! 🙂 Thanks for the links and apps as well! 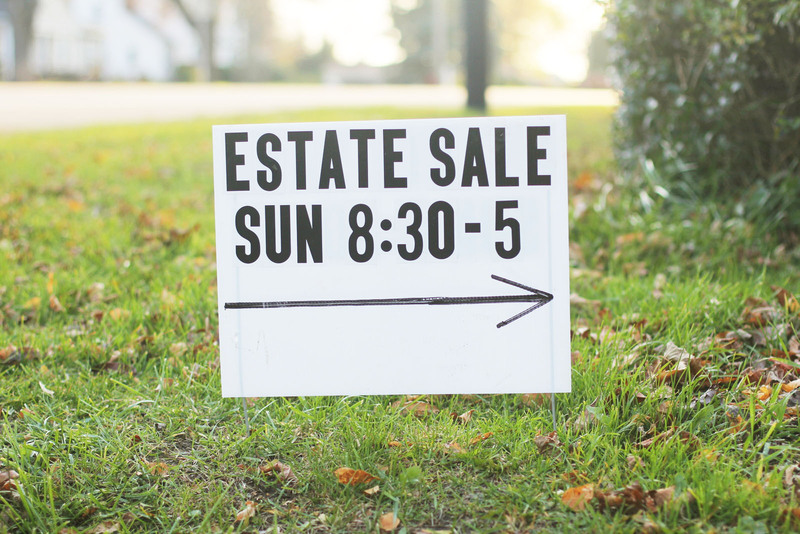 The first few Estate sales we attended were awkward, I felt so bad for the family members that I wasn't sure if I wanted to go to any more. Then I had the granddaughter of an elderly lady that had passed away explain to me how happy she was to see that someone else shared her Grandmother's appreciation for "ugly old things". Now we go whenever we can find one in our area. I love reading your posts! You provide such fantastic information and advice. I would never have thought of going to an estate sale to find things. Thank you for providing not only Q&A information, but general etiquette as well. I have been reading your blog for a while and noted you went to the Pymatuning Deer park. I was just visiting in that area and went to a GIANT flea market in Rogers, Ohio. Have you been to it? It is pretty awesome for thrift hunters so I thought I would recommend it if you had not yet been. I really have been wanting to go to an estate sale ever since you first mentioned going to one! Great tips! Thanks for sharing you knowledge on estate sales! I've always wanted to check on out, and now when I do I will know what to expect! I can't believe how many people either thought estate sales were for the wealthy or felt weird/intimidated about going to one. I live in Western NY and estate sales are the norm here. There are about 4 professional companies that hold a few every weekend (along with private families who hold their own). I never felt weird going to one. Professional ones never have the family there and if it is a private sale then the family is typically happy that someone is going to use their family members items (as opposed to just throwing it out). The best part is that the companies take a lot of photos and I can easily decide which to go to. i go to lots of estate sales and the last few i have been to that were put on by companies used those little square swipe things that attach to your iphone! it means big trouble for me, because i'm usually limited by how much cash i have on hand! i love estate sales so much. it is so fun coming out with a huge basket full of vintage for just a few dollars! This is so helpful and kind of you to share. Hey, I supermuch enjoyed your interview over on Kyla's blog!! This is a great post. I also love estate sales! I've been to a few the morning of the first day. People often come much earlier than it is supposed to open and either start a list of names or the people running it start a list. Sometimes this works and sometimes it doesn't. I've seen people get a little crazy and start pushing to be the first in when the doors open. In other words… I really like your tip about going the LAST DAY. Not only are items often much cheaper, but it's a more relaxing experience! Oh my gosh I have been wanting to go to an estate sale for SO LONG now, but there are never any by where I live… or maybe I'm just not looking hard enough. I feel like the key would be to get to it early because then you really get first dibs on everything. Now I want to go, like tomorrow! Everytime I see an estate sale mentioned on an international blog I get envious! all we really have are garage sales where most of the stuff is all sorted out already, and if it is a deceased estate garage sale they have already been through the rooms and set up tables or something in each room with the "good things" and I shudder to think what they throw out thinking it's too crappy to sell! This is such a great post! Up until a few months ago, I worked for an estate sale company (I'm a library girl now). It was BY FAR the most fascinating job I've ever had. The families really depended on us to sort through a lifetime of items in an objective way because sometimes it's just too hard for them to do. A lot of the time, they were very dependent on the money that their sale would bring in, so I'm always trying to convince people that estate sales are a great place to treasure-hunt. Thanks for getting the word out! Awesome tips! I have never been to an estate sale, but after reading this, I can't wait to go to one. Thank you so much for posting! I just checked my local listing and there's an amazing estate sale going on next week that I would have otherwise missed out on. I'm so excited to check it out! You rock, Kaylah! Very nice blog entry. Thanks! As an estate sale professional (I also blog about them at truefindsblog.com), I'm so surprised that so many people know so little about them. They are a great place to shop, much better than thrift stores or garage sales in my opinion because they usually include so much, not just stuff that's been selected as unwanted. And btw, I sell food all the time at my sales, as long as they aren't expired (then I give them away). Keep up the good work! I am in love with my estate sale treasures. A red vintage slip and a himalayan salt lamp are some of my fave recent scores! Hi I'm Jessica, I just found your blog and it's adorable! I also just discovered estate sales and have a new hobby–i LOVE them! I find everything you pointed out to be very true of my experience as well–happy thrifting and blogging! My boyfriend's mom always go to Estate Sales & she always find great things… I might have to try one.. I love thrifting anyhow. Thanks for the tips! I am really interested about this estate sale and hope they give out items for reasonable prices. I think it’s like everything under one roof. I just came across your blog today- great advice! I'm going to look into estatesales.net. I go to a lot of garage sales and some auctions, and lately my husband and I have been to more estate sales. We usually find them in ads on craigslist or in the paper. You have really hit on the fun of going to these sales- the unique items for sale, the good prices, the nice people, and seeing the cool houses! If you want to see some of the things I have found at sales, I have photos at theblogcore.com, under Deja New! I blog about our weekend estate sale adventures and finds. I love your blog!